Please note that space numbers may be different from previous years. Fees: All Spaces are $50 10X10 non refundable contriubution. Select Registration Form: Registration PDF. Please read through this message so you will have a positive experience and ease of setup. VENDOR SETUP ASSISTANTS WILL BE ON PREMISES STARTING AT 8:00 AM. NO ONE CAN SET UP ON MAIN STREET UNTIL 8AM. MAIN ST. DOES NOT OFFICIALLY CLOSE UNTIL 8:30 AM SO EARLY ARRIVALS NEED TO BE AWARE THAT NORMAL TRAFFIC WILL BE ON THE ROAD UNTIL 8AM. ONCE MAIN ST. IS CLOSED, VENDORS MUST ENTER FROM THE ROUTE 302 WEST END of Main St. ONLY. YOU MUST BE SETUP AND READY TO GO BY 9 AM. NO LATE ARRIVALS CAN BE ACCOMMODATED. (1) Main St. between State Route 302 and Center St. (2) Crawford Commons/Gazebo area 61-65 Main St. THERE IS ALSO THE AREA FOR THE FARMERS MARKET, PETTING ZOO AND HEALTH & WELLNESS WAY LOCATED ON NEW ST. between Main and Depot Sts. and will be closed to traffic during the event. ON SITE ASSISTANTS WILL DIRECT YOU TO YOUR SPACE ON THE MORNING OF THE EVENT. MAIN ST. – VENDOR SPACES ARE ALONG BOTH THE NORTH AND SOUTH SIDES OF THE STREET. ONCE YOU ARE UNLOADED, PLEASE MOVE YOUR VEHICLE QUICKLY OUT OF THE AREA. CRAWFORD COMMONS (61 Main St.) – VENDOR SPACES ARE LOCATED ON BOTH SIDES OF THE PARKING AREA. PLEASE ENTER ONLY FROM MAIN ST. ONE WAY TRAFFIC ONLY - IN AND OUT. ONCE YOU ARE UNLOADED, PLEASE MOVE YOUR VEHICLE QUICKLY OUT OF THE AREA. WE NEED EVERYONE TO PLEASE BE QUICK UNLOADING AND MOVING YOUR VEHICLE SO WE CAN GET EVERYONE SAFELY SETUP IN TIME FOR THE EVENT. BREAKDOWN BEGINS AT 2:45PM. Town of Crawford police ask all vendors to be off the street by 4pm when the roads will be re-opened to regular traffic. THEY WILL BE PERSISTANT!! Police assistance will be located on Main St. at New St. Lions Club assistance will be located on Main St. in front of 61 Main St. 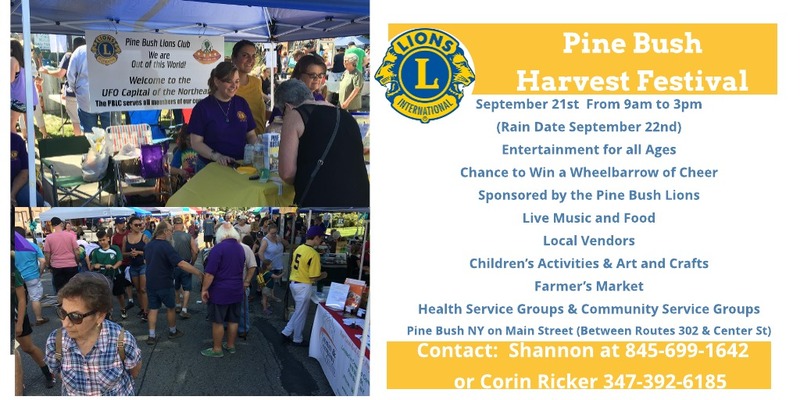 The Pine Bush Lions Club Harvest Festival is an annual event that takes place in the heart of the Hamlet of Pine Bush on the third Saturday of September. The purpose of this annual festival is to join people of all ages together in celebration of our community. 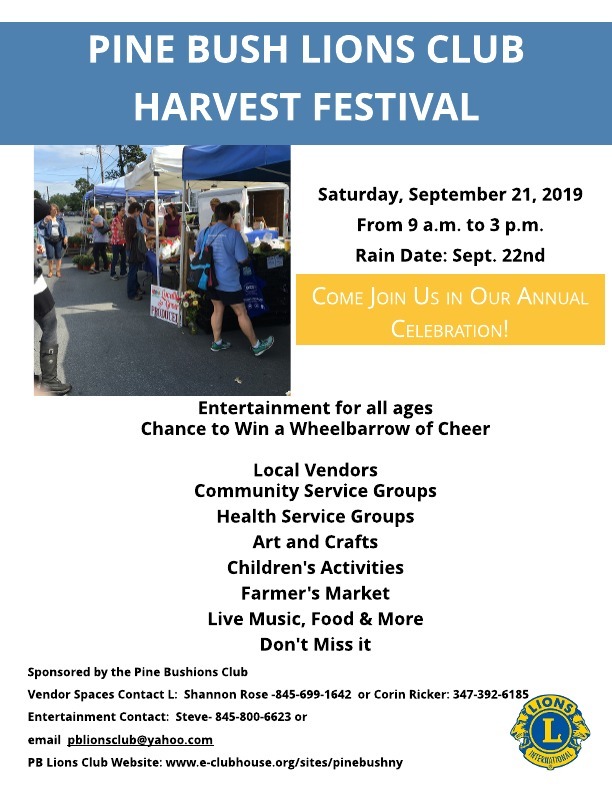 It is a fun time for all ages and includes local arts and crafts people, community information booths, food court, music and live entertainment, and games.